Up Yonda Farm In Bolton Landing: A Year Round Lake George Attraction! 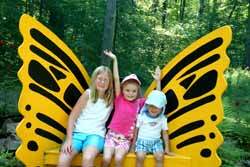 There is fun to be had all year long at Up Yonda Farm in Bolton Landing! Operated by Warren County Parks and Recreation, this environmental educational center provides an opportunity for visitors to learn while enjoying nature. The most well known attraction at Up Yonda Farm is available during the summer months when many colorful butterfly species can be observed, fluttering about right before your eyes. Up Yonda Farm's enormous butterfly garden offers viewing for all stages of butterfly life and is enclosed in a netted structure, which is wheelchair accessible. The exhibit peaks from late July to early September, before the magnificent monarch butterflies make their long journey from New York State to Mexico. 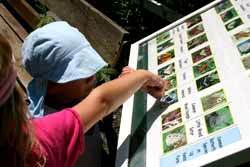 Children love Up Yonda Farm! From the fluttering butterflies and educational museum to the sugar house, pond, wetland, starry dome and all the trails, this is the place for any family in search of adventure! In the winter, Up Yonda Farm offers snowshoe rentals for both kids and adults. Explore the snowy Adirondacks on a guided tour. Look for animal tracks in the snow or enjoy a leisurely, self-guided snowshoe stroll! For more information on Up Yonda Farm in Bolton Landing, call them at (518) 644-9767.